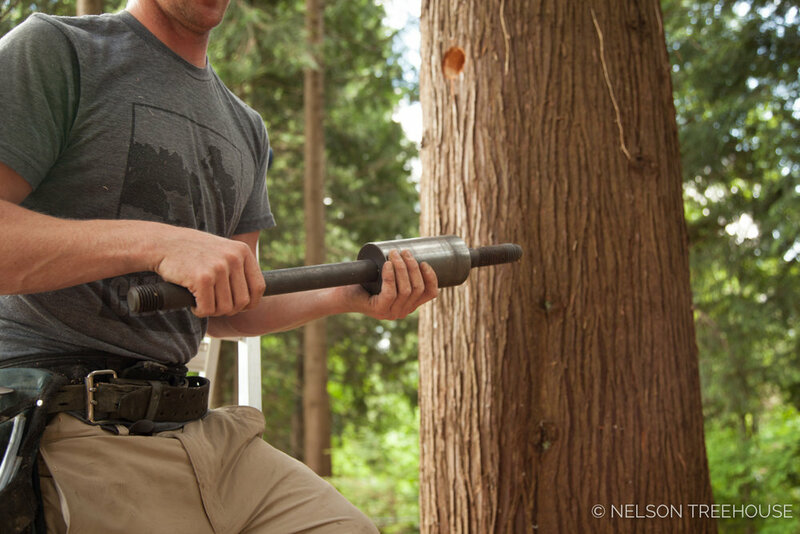 Want a closer look at how the Nelson Treehouse crew attaches the treehouse to the tree? The magic lies in the Treehouse Attachment Bolt, or “TAB”. This heavy piece of hardware is the most important structural element of treehouse-building. TABs are made of hardened steel and act as artificial tree limbs on which the main structural support members of the treehouse rest or hang. When installed correctly into the trees, a Standard Limb TAB may support between 8,000 and 10,000 pounds of force (softer trees like pines and cedars may support less force, while harder trees like oak and hickory may support more force). * TABs are unequivocally the best way to attach treehouses to trees. Not only do TABs support large loads with ease, they also allow the free growth of the tree. In other words, TABs do not cause lasting harm to the trees! Unlike girdles and chains that wrap around the circumference of trees, TABs do not choke or damage their living hosts. The tree reacts to a TAB by growing wood around the perimeter of the boss (the central component of the TAB). This seals off any possibility of airborne fungus or disease infiltrating the tree. Nutrients continue to flow through the essential cambium layer of the tree, located just below the bark, and the tree continues to grow in its normal fashion. Happily, as the tree envelops the TAB, the hardware becomes stronger and more secure. TABs are made of of two separate pieces of steel, and consist of four main sections: the coarsely threaded end, the boss, arm, and short threaded section (see Figures 1 and 2, below). The coarsely threaded end secures the TAB into the heartwood of the tree. The boss, the thicker piece of 3-inch diameter steel, provides the majority of the TAB's sheer strength and allows for greater distribution of the load. The arm extends outward from the boss and acts as a limb to support beams or other structural elements. At the end of the arm is a short threaded section designed to accommodate a K-nut. We fabricate our TABs with a local Seattle machinist. You can find the TAB for your treehouse here. FUN FACT: Mature trees grow upward from their tips, not their base! This natural growth pattern allows TABs to remain at exactly the same height where we installed them. It's also the reason why treehouses don't move up as the tree grows taller. The main growth factor we must account for is expansion in girth all along the tree length. The TAB is designed to accommodate an increase in tree girth. As the tree grows, it will envelop more of the TAB, moving closer to the beam along the stem. Prior to the tree conflicting with the beam, a retrofit will be necessary to maintain a margin of tree movement. Pete can attest to the longevity of TABs: he used TABs to build each of the treehouses at TreeHouse Point over ten years ago, and both the trees and TABs are just as healthy and strong today as they were then. Check out the TABs on the Upper Pond treehouse! They're still just as supportive today as they were when Pete first built this beauty. In 2016, we had the incredible opportunity to evaluate the load-bearing capacity of our TABs at the ICC-accredited testing facility at Washington State University (WSU). We conducted a series of directional tests on our Standard Limb (SL) and Heavy Limb (HL) TABs in two different tree species: Doug fir and western red cedar. Click here for a summary of the findings. Project Manager Scott Atkins oversees the testing of TAB weight-bearing capacities at Washington State University. Stay tuned - we're releasing the results soon! What's the story behind the TAB? In 1997, arborist and builder Jonathan Fairoaks brought a treehouse attachment device to the annual World Treehouse Association Conference in Oregon. This device was a three-inch diameter stainless-steel pin that, when sunk into the heartwood of a tree, was able to support far more weight than anything we had attempted thus far. Jonathan's device caught the attention of Michael Garnier, host of the conference and renowned treehouse hotelier. Over the course of the next year—and with the help of his head engineer, Charley Greenwood—Michael refined a tree-bolt design that came to be known as the Garnier Limb, or GL. The GL evolved into what we now call the TAB. If you're interested in more details about the illustrious evolution of TABs, check out the full story in Pete's books Be in a Treehouse and New Treehouses of the World. Wondering how to install a TAB? Luckily, Daryl's here to guide you through the basics of TAB installation. Check it out in the video below! Pete Loved building the Bonbibi treehouse at TreeHouse Point! You can replicate this beauty with our No. 11 Walla Walla plan. We hope you've enjoyed learning about the miracle that is the TAB! Let us know in the comments below which type of hardware you'd like us to highlight next. To stay updated on all our blog content, subscribe to our mailing list and give us a follow on social media.